The hot new series GENERATION GONE by Aleš Kot and André Lima Araújo is being rushed back to print in order to keep up with overwhelming customer demand. Set in America in 2020, GENERATION GONE follows three young hackers with nothing to lose. A secretive scientist with a plan. One final job. What happens when you're poor, angry, and get superpowers you never asked for? Skins + Unbreakable = GENERATION GONE, sort of—if you also include multiple trips to the sun, weird black goo, a breakup fight inside a nuclear factory, love, hate, anger, loss...and survival. GENERATION GONE is for every kid struggling out there. It's about what it means to be young in the USA, 2017. GENERATION GONE #1 will remain available for purchase across all digital platforms, including the Image Comics website (imagecomics.com), the official Image Comics iOS app, Comixology’s website (comixology.com), iOS, Android, and Google Play. 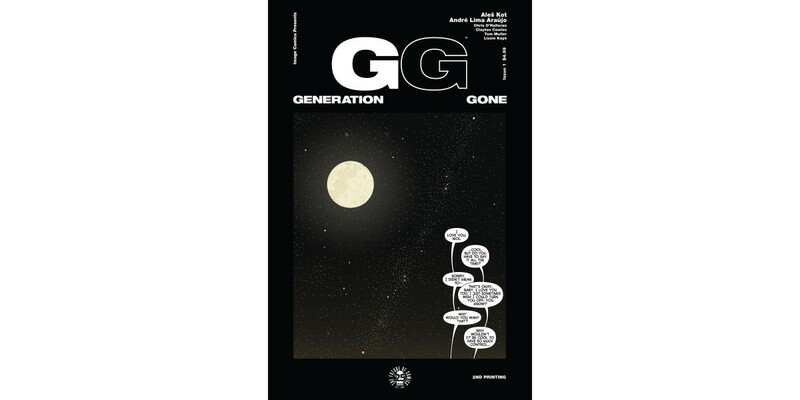 GENERATION GONE #1, 2nd printing (Diamond Code JUN178446), GENERATION GONE #2 Cover A (Diamond Code JUN170753), and GENERATION GONE #2 Cover B Hickman variant (Diamond Code MAY178626) will be available on Wednesday, August 23rd. The final order cutoff deadline for comics retailers is Monday, July 31st.